The winter Virtual Learning Show, organised by Colin Steed is now at day two. Here are my summer show and winter day one blogs. This is what the line up was for the day. Mike Collins from DPG spoke passionately and eloquently about where to start with communities. Mike said that at one time his view of communities was to just get going, just go and do it. He now feels that the strategy is important. I think this is key as it can involve different people, departments and needs role models and work to win over sceptics. Talk of passion for changing how people approach technology in learning was an important point that Mike delivered, and did so with passion himself. Mike was honest in sharing that, even after 18 months of the DPG community, that they were still learning lessons from their learners, about what they wanted from the community. It’s refreshing to know this if you are at the beginning of your journey or battling up hill! David Smith from TMA World talked about how to leverage technologies and not focus just on PowerPoint. David spoke through too many bullets, bad clip art and so on that a lot of people in the audience of the session were on board with, but we all know colleagues and practitioners that don’t know this yet. David spoke through different types of interaction and how important this is for the online session. In the chat window there was a raging debate about how many slides are too many, or too few in a session. Some commented that too many felt like a film and was difficult to keep up with. Another person commented on two slides being used in a 45 minute session and the boredom that ensued. I loved the radio analogy when David said “everyone’s tuning in to the same radio station: WII FM – What’s In It For Me”. There was discussion about engagement every 3-5 minutes and how important that is. There was also discussion around use video/webcam in online sessions: great if you get the lighting and background right and use it at the right times so as not to distract learners throughout. Karen Hyder started talking about preparation in online delivery. Karen is an experienced in online delivery and producing – it was a great experience to be a producer for one of Karen’s LPI webinars earlier this year. This session was best practice interaction in looking at how to change up from face to face delivery into the online classroom. It focused on some of the face to face tools a lot of people are used to and what might happen in the online session instead. 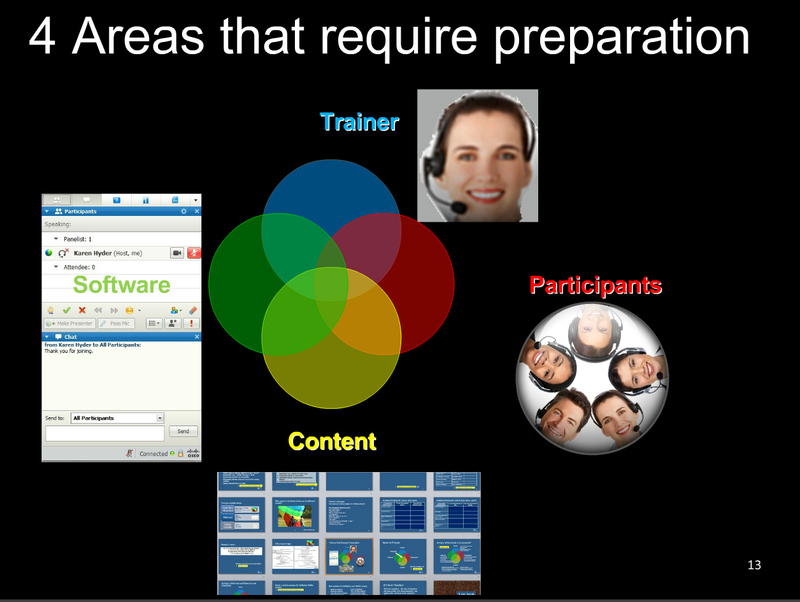 Karen highlighted areas to prepare for your online event: the trainer, the content, the participants and the software. This session was great for people looking in more detail about their preparation for online classes. Karen highlighted not to be complacent about your online delivery, even if something has gone well. There were all sorts of bits of advice, including the potentially controversial “ignore chat” in order to deliver well. She did then advocate to come back to it and cover the contents. I think one of the most important things that Karen highlighted was that for “every one hour of online presentation you need three hours prep. If you are doing the instructional design it could be 10 times that”. Something for people to take on board when planning their sessions and calendars. 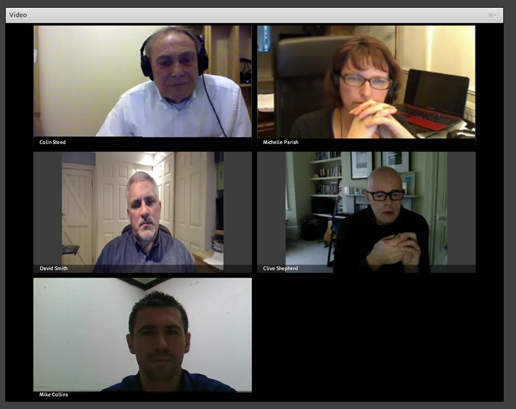 This was a great session earlier in the year with lots of video feeds online. In this session it was all about engagement. On the panel were Clive Shepherd, David Smith, Michelle Parish and Mike Collins. Colin introduced the concept that engaging learners online is more than just ticks, crosses and application share. David Smith said that trainers who were new to the online classroom need to have experienced it themselves. I agree with this situation and it’s something mirrored by the attendees of the Certified Online Learning Facilitator course – attendees often say that they will be able to empathise with their own attendees having been through a range of emotions and reactions themselves as (possibly/probably) new to online learning themselves. Mike Collins brought in some lessons from his community session from the morning and getting learners engaged with the content earlier in the learning process. He also talked about getting people from the mindset of I know what I know to wanting to share and help other people learn. Progress can be made with those people by talking through how the tools work, sharing some blogs those people have found useful themselves and helping them to realise the value. Clive said that we have to be aware of how people want to communicate and engage. He highlighted that trainers are often comfortable in the physical classroom whereas learners often bring baggage with them. 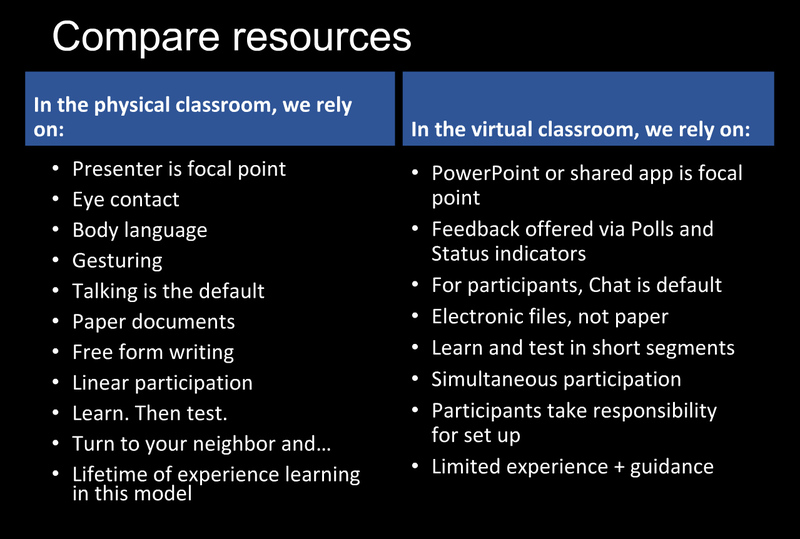 We have to remember that online too and ask learners if they want to use chat because they don’t like the microphone, or perhaps microphone because they aren’t comfortable typing. Another interesting day online with lots of food for thought and discussions galore in the chat panel. All very engaging and lots to reflect upon. I look forward to next year all ready!